ParmisPDF is the perfect PDF with the ability to perform wide range of operations on PDF files & converting Word documents (.docx & .doc), rtf & image files to PDF. With ParmisPDF you can easily add watermark, stamp, background, header, footer, text, dynamic text and image onto PDF files. With ParmisPDF setting security settings on PDF files such as password, permissions/restriction and encryption never been so easy. ...... With find & replace feature you can search/replace text in a single or multiple PDF documents quickly. - Convert Microsoft Word files (.doc/.docx), .rtf, .txt, .html, .jpg, .gif, .tif, .bmp, .png, .emf & .wmf files to PDF. - Offering one-click conversion, ParmisPDF simplifies the PDF creation process. All PDF files created with ParmisPDF are 100% compatible with other PDF viewing applications including Adobe Reader and Adobe Acrobat. 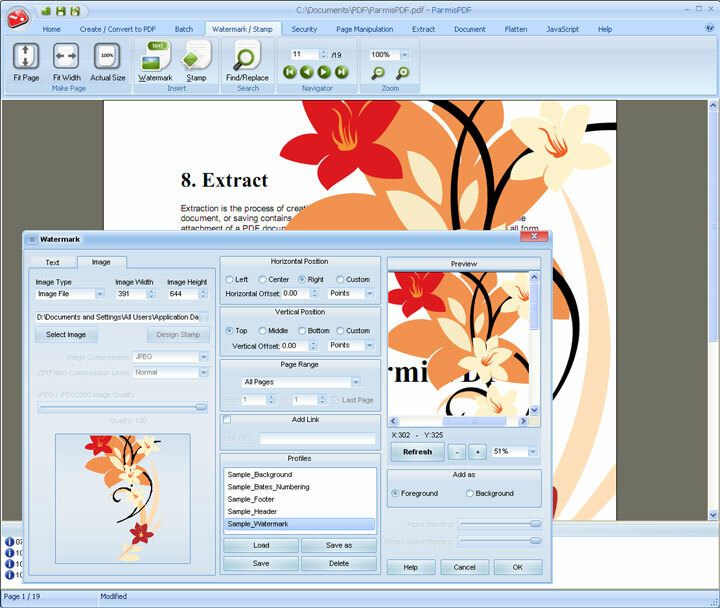 - Simply insert text or image watermark, stamp, background & header/footer onto one or a range of pages in PDF documents. Customize the content settings; This includes Position, Alpha Blending, Stroke, Text formatting & link. ParmisPDF is a perfect PDF tool with command line and batch. Qweas is providing links to ParmisPDF Premium Edition 7.1.93.2 as a courtesy, and makes no representations regarding ParmisPDF Premium Edition or any other applications or any information related thereto. Any questions, complaints or claims regarding this application ParmisPDF Premium Edition 7.1.93.2 must be directed to the appropriate software vendor. You may click the publisher link of ParmisPDF Premium Edition on the top of this page to get more details about the vendor.